Icon Heroes are makers of novelty office products and stationary, who have producing Star Trek products since 2014. 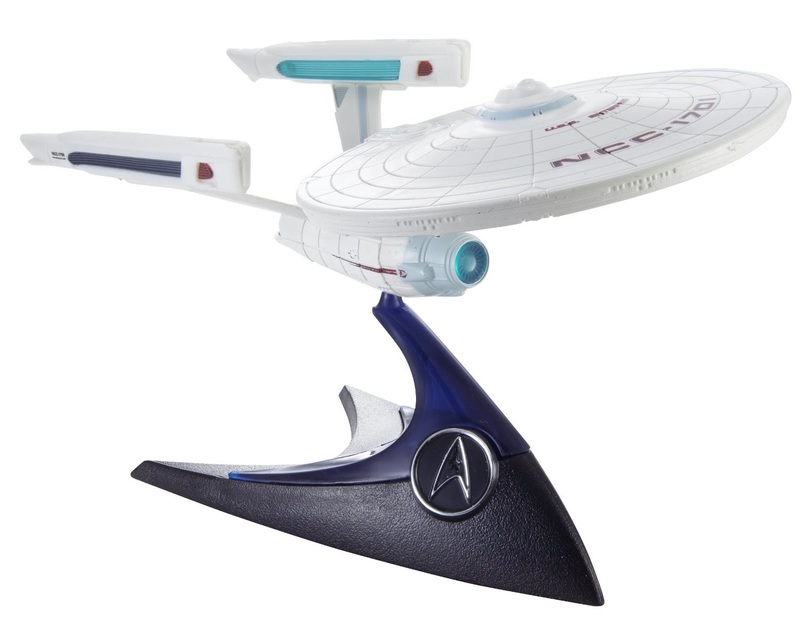 Their range from the fairly mundane officer product, but with a Star Trek twist, up to high end statues in the form of bookends and paper-weights. So far all of their products have been TOS or TNG designs. This list is in reverse release order, with the most recent products at the top of the page. Notes: TNG mouse pad. 2018 San Diego Comic Con exclusive. Notes: Range of TOS mobile accessories. 2018 San Diego Comic Con exclusive. This is a list of Star Trek stories written by John Jackson Miller, who to date has written a number of stories in the 24th century era. 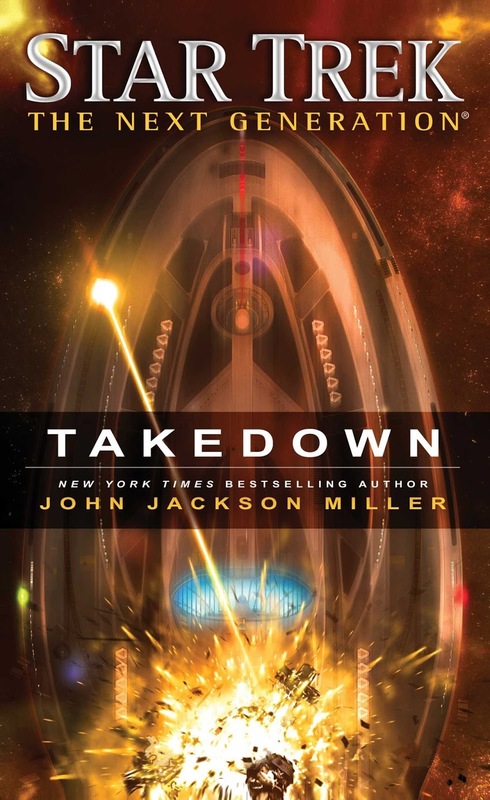 Before entering the world of Star Trek, Miller was a well established writer, particularly known for his many Star Wars comics and novels. Miller would have written for Star Trek many years earlier, having sold a story for what would have been a novella in the Corps of Engineers series - Indeed it was his first successful prose pitch. Unfortunately the series was then cancelled before his story reached publication. The list below is of Miller's Star Trek stories, presented in publication order. Notes: A Titan ebook novella, and sequel to the TNG episode The Next Phase. 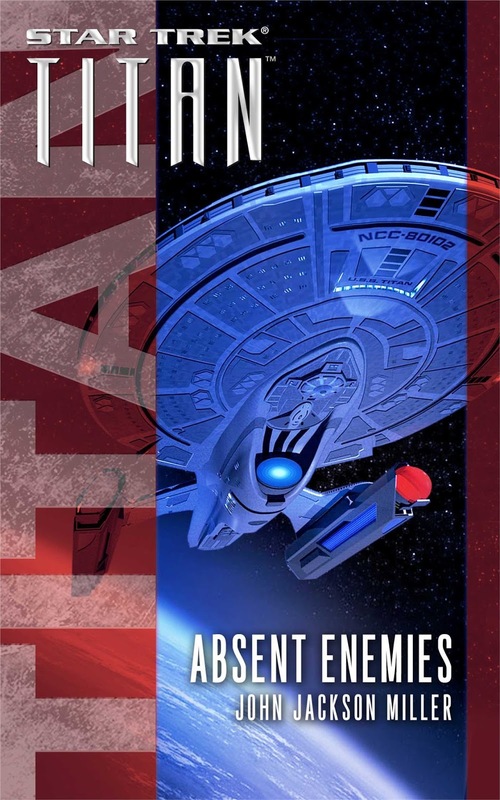 Notes: A TNG-era crossover novel, featuring the crews of the starships Enterprise-E, Aventine, and Titan, and is also a sequel to the TNG episode The Nth Degree. Page created 19th June 2016. Last updated 19th November 2017. This is a list of Star Trek stories and books written by Kevin Dilmore, who has written numerous novels and novellas, a comic, and many articles for various Star Trek magazines and StarTrek.com. 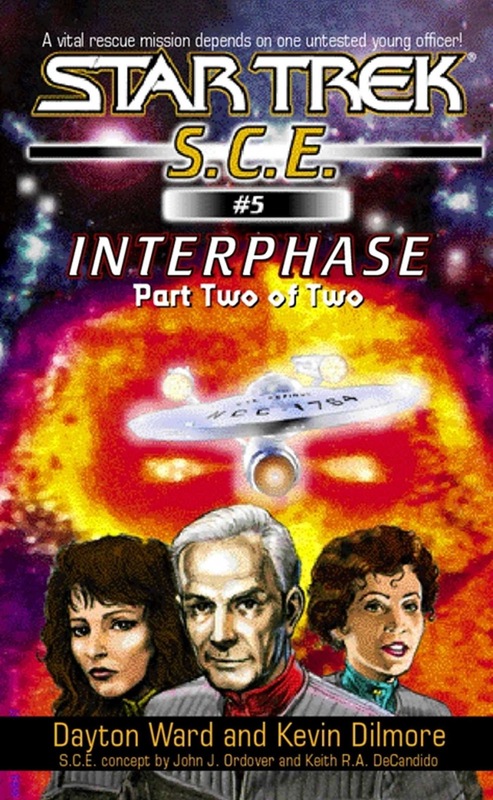 Dilmore entered the world of Star Trek fiction as one of the regular writers of the ebook novella series SCE, and also began to work with his regular writing partner Dayton Ward on that series. Working mostly with Ward (with the exception of a couple of solo pieces of shorter fiction) Dilmore has since gone on to write numerous Star Trek books, with a particular focus on TOS and TNG stories. With Ward, fellow author David Mack, and editor Marco Palmieri, Dilmore also co-created the Vanguard, and later Seekers series, with Ward-Dilmore and Mack writing alternate books in both series. The list below is of Dilmore's Star Trek stories, presented in publication order. Notes: Dilmore's first Star Trek story, a SCE novella; the fourth in the series. First half of a duology, and sequel to The Tholian Web. Co-written with Dayton Ward. This book was later reprinted in the first SCE omnibus, Have Tech, Will Travel. Published: February 2001 (ebook), January 2002 (omnibus). 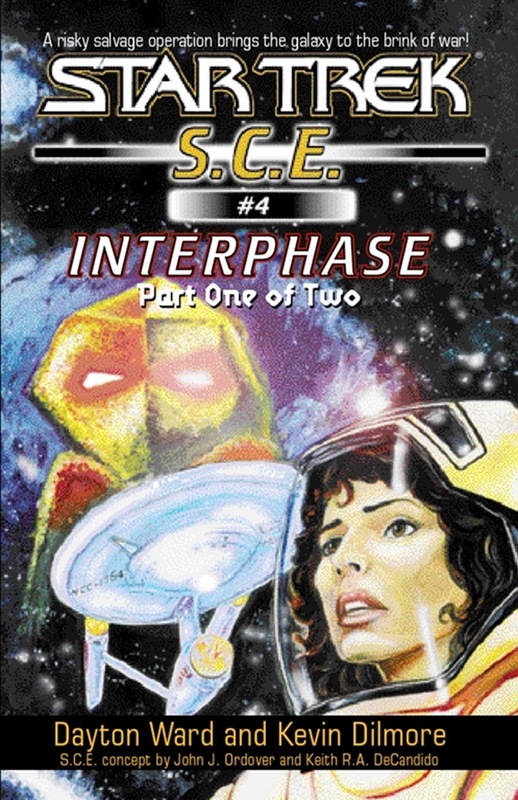 Notes: An SCE novella, the fifth book in the series, and second half of a duology. Co-written with Dayton Ward. This book was later reprinted in the SCE omnibus Miracle Workers. Published: March 2001 (ebook), February 2002 (omnibus). Page created 15th June 2016. Last updated 2nd February 2018. Funko's Pop! vinyl range of stylised figures encompassed characters from a huge range of TV series, films, video games, and more, including numerous Star Trek characters representing multiple series. The first Star Trek characters entered the range in 2013, and there have been regular additions in the subsequent years, typically coming in a large assortment of characters from one particular series at a time. There have also been a few additional retail exclusive characters. This list is in reverse release order, with the newest releases at the top of the page. 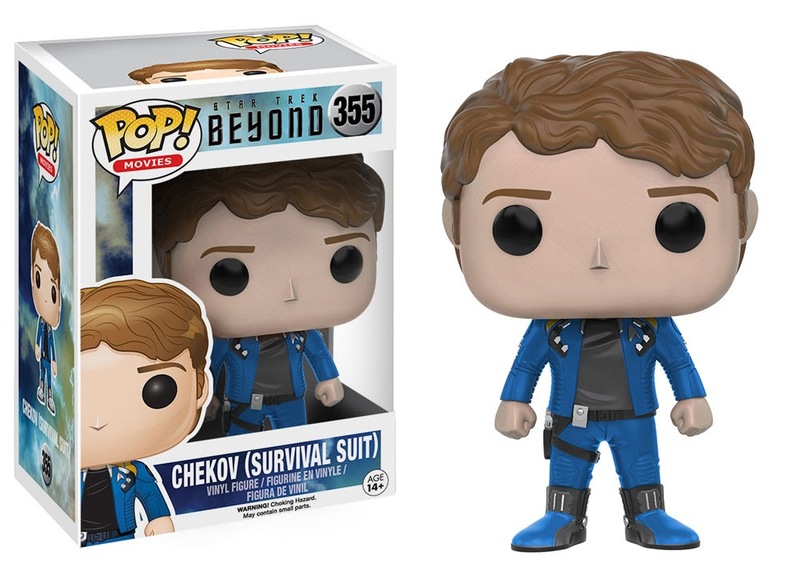 Overview: GameStop exclusive Star Trek Beyond release. 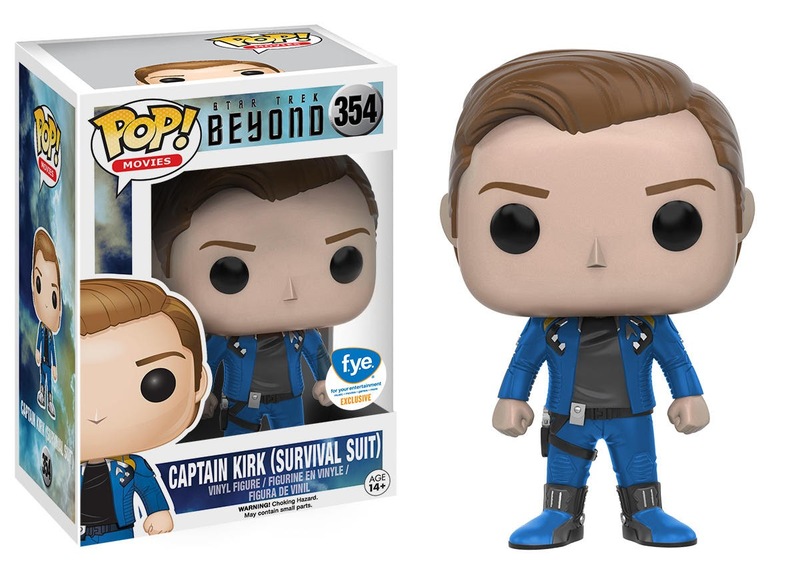 Overview: Fye exclusive Star Trek Beyond release. 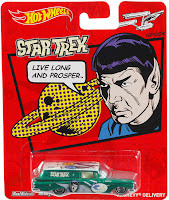 Since 2009 Hot Wheels have released a number of model Star Trek starships. The collection so far includes ships from TOS, TNG, and nuTrek. Most of the ships have been part of a mid-scale series, where ships are typically about fifteen centimeters on the longest side. There are also a few releases as part of Hot Wheels smaller model-car series, which are about seven centimeters long. Most of the mid-scale ships have been released in waves of four to six ships. The third was was released as a multi-pack with the board game Star Trek Scene It?. This list is split into the two scales, in release order by the initial release of any ship class (with any subsequent variants listed immediately after) within each section. Overview: Movie-era refit USS Enterprise. This model has been released twice: As part of the first series, when it was inaccurately labelled on the packaging as the Enterprise-A, and in the second series with the correct packaging. Release date: May 2009 (series 1), January 2010 (series 2). 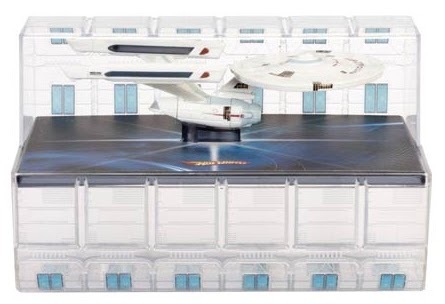 Overview: Refit USS Enterprise in a special space-dock style display case, and painted as if part-way through the refit. A San Diego Comic Con exclusive. Hot Wheels' Pop Culture range is a wide-ranging series of die-cast toy cars featuring graphics based on pop culture brands, including TV, film, video games, comics, food, and more - There have so far been two Star Trek series within this range. Each of the Star Trek cars focuses on one character, which joins other Star Trek images and iconography decorating the entire vehicle. Both of the series so far have been TOS designs, with the first release using a Gold Key Comics style assortment of images, and the second series using stills and promotional photos from the series. Captain Kirk '49 Ford C.O.E. Overview: Part of the Gold Key style series. 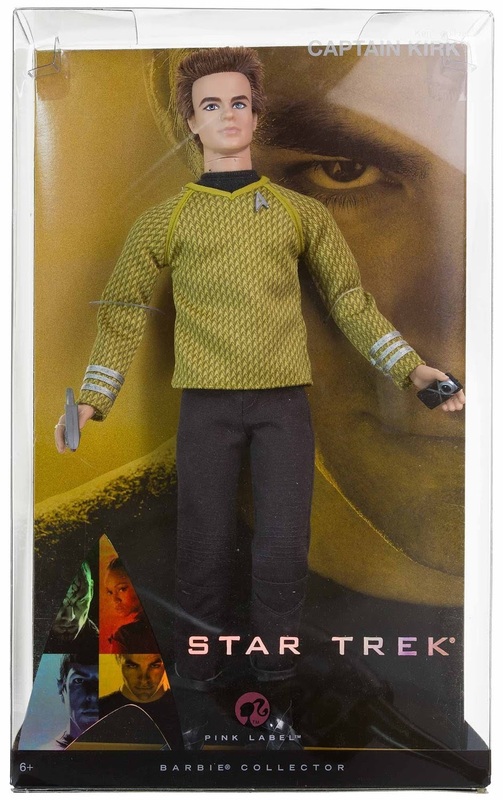 This is a list of Star Trek Barbie dolls and related merchandise. 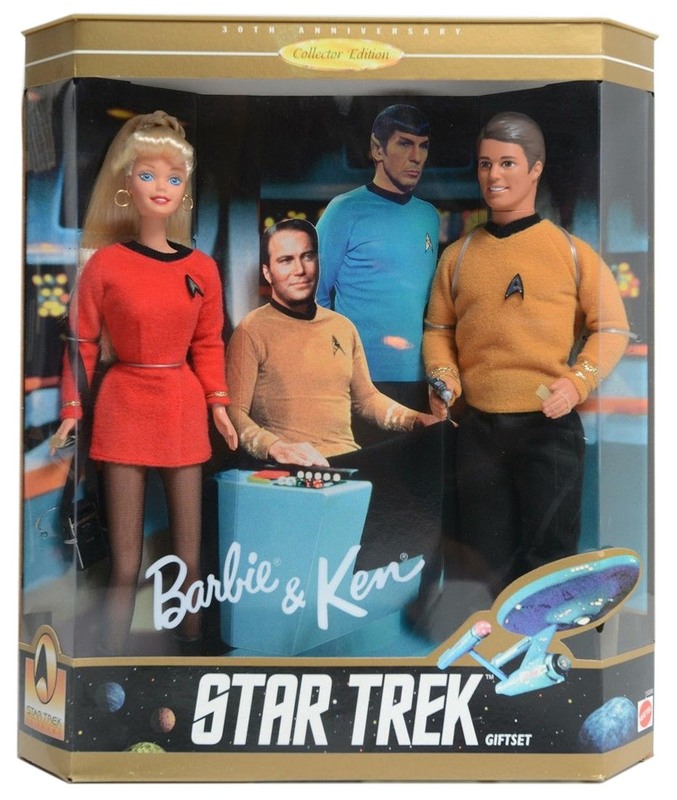 Mattel released the first Star Trek Barbies in 1996, to commemorate the series' thirtieth anniversary. Later releases have also marked major milestones for the franchise. This list is in release order. Notes: The first ever Star Trek Barbies, released to mark the franchise's 30th anniversary. 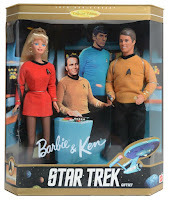 A two-pack containing Barbie and Ken in Starfleet uniforms. 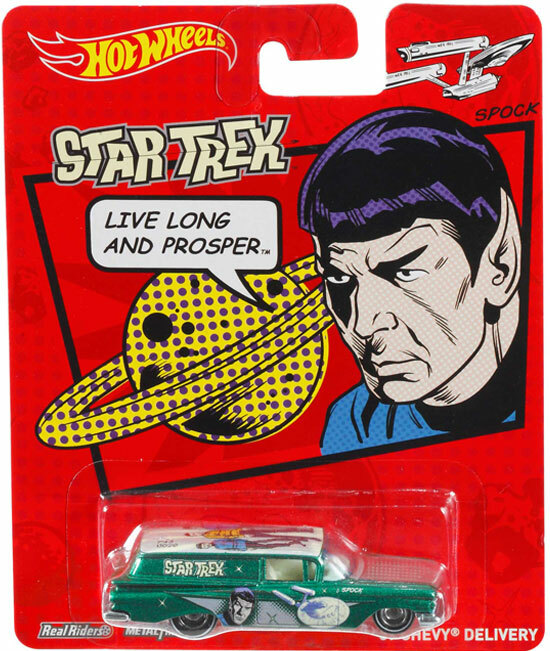 The packaging includes cut-outs of Kirk and Spock on the bridge, setting a scene in which the four characters meet. Release date: 1st January 1996. 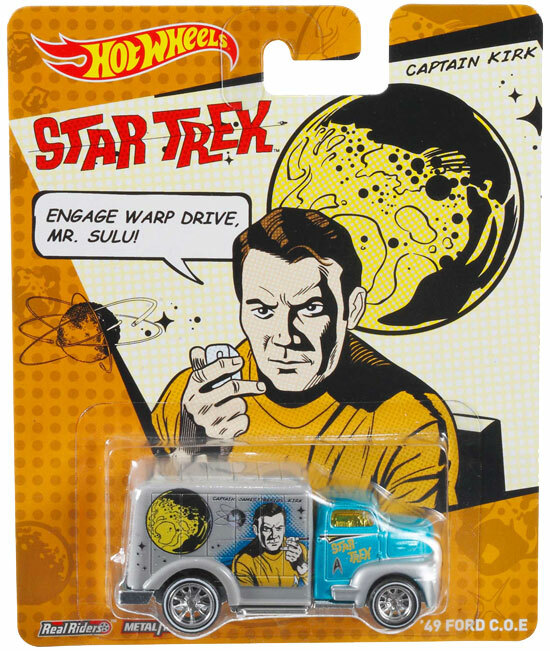 Notes: One of three characters released as part of the merchandising around the release of the first nuTrek movie. Release date: 26th March 2009.